T-Mag Magnetic Drive Pumps is creating a storm of change within the process industry. 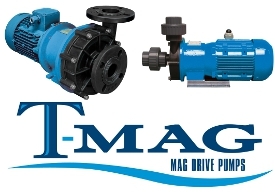 The T-Mag magnetically driven pump surges ahead with the latest heat dissipation technology and horsepower ratings up to 5 HP. These pumps offer some of the highest flow rates seen in the industry. Ultimately, the T-Mag pump will bring you increased productivity, reduce operational costs & downtime, and provide peace of mind. Sealless, which means zero-emission, leak-free design. Double end supported ceramic shafts. Patented buffer system is specially designed to absorb vibrations and shock caused by adverse operating conditions. NPT and Flanged connections available.